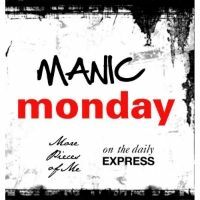 Well, hello there and welcome to another edition of Manic Monday! Last week when I was in San Antonio, I got a shipping notification from J Crew Factory. I was ridiculously confused because I hadn't ordered anything. Did drunk Carylee order something again? (You know that's happened to you…) Anyhoo, I know I let out an audible squeal when I realized it was this gingham shirt! I had ordered it a few months ago - maybe in March? It said it was on backorder until July, but I went ahead and ordered it anyway. You'd think it wouldn't be hard to find a basic gingham shirt like this, but guys, it was HARD. I kept coming back to this one, and figured I could always keep searching in the meantime, and cancel the order if I found something better. I was THISCLOSE to giving up, ironically, I had thought about it a couple days before we left for San Antonio, so the shipping notification was timely! It's perfect! It's so lightweight making it still comfy for the summer, and will be a great layering piece in the colder months. It fits pretty true to size - I love that it's relaxed fit, but not super "boyfriend" fitting. And seriously, for $29.50, I should probably buy a backup in case this one falls apart, considering how long I waited for it. How else do I plan on styling this? Funny you should ask. Hope everyone had a fabulous 4th of July weekend. I swear the world would be a better place if 3-day weekends were the norm! I mentioned just before the holiday last week that I wasn't sure what we were going to be doing to celebrate. Welp, we celebrated by accidentally buying me a new car!!!! Yes, I say "accidentally" in jest. My car has been paid off for about a year and a half now. It's a 2007 Saturn Vue, and while I love her - she's got over 100K miles on her, and since the husband's Camaro is a bit of a show car, he's definitely very particular about when we use it - avoids rain and leaving it at the airport when we travel. This, in essence means that we're working around my Saturn Vue between the both of us, as if we actually only have one car. Yeah, you can imagine how inconvenient that gets really quickly. So, while we've been ready financially to get a new car for awhile now, it was really my own shopaholicism that was keeping us from doing so. It was sooo nice on Friday and I wanted to do something outside. We had lunch at a restaurant patio, and I was trying to think of something we could do outside that I knew the husband would agree to. When I said, "We should go look at cars…" his face instantly lit up and I'm pretty sure his eyes bulged out of his head, but he tried to keep cool and calmly said, "I'd be down with that." And well, this is exactly why I've never even wanted to even look because I knew I'd get attached to something. Long story short - we test drove a few, but I ended up loving this Audi, which is surprising because I didn't know anything about Audi, but I couldn't believe how much I loved this car. I won't bore you will all the specs, but for all you car enthusiasts out there, it's a 2014 Audi A6 Quattro, 3.0L Supercharged V6 with AWD. I seriously just love her and have actually been doing the driving vs. just being the passenger! PS Check out Kellie for a little Carylee shout out! Love when a back order ships, such a surprise!! Also, congratulations on the new car!! Yes! It's like past me bought future me a gift! Haha! Ok that shirt is a classic I have a very similar one from Banana and congrats on the new ride I am itching for a new one but I might have to wait about a year or two. You look so classy! Great gingham shirt and congrats on your new car, its beautiful! P.S Loved reading more about you over at The Daily Express! I hope you get it - it really is awesome! and thank you! She is so creative with her posts, that was a fun read for me, too! I know right?? I have a handful of gingham shirts but they're all a smaller check pattern. This one is just perfect! Congrats on your new car!!! I actually showed your instagram pic to my hubby who desperately wants an Audi :-) You got a beauty there!! Love the Gingham shirt too...been lusting after gingham for a while and will rely on your pics for inspiration for sure! Haha! How funny! My husband is thrilled with my choice. I have to remind him that it's *mine* meaning- he can't make it look like a boy car!!! And I hope you get your perfect gingham shirt! I just love this one! Your outfit is so lovely! You know I'm loving gingham this summer! What a fun surprise that you forgot you order it! Loving the green skirt .. .and the Valentino heels .... of course!!! The Valentinos like to steal the show sometimes! :) Thanks for commenting! LOVE it! I was on the hunt for a navy gingham shirt for what seemed like ages before I finally found once in Chicago this past April! I wear it all the time.. such a staple!! This is such a cute outfit and the color is great! 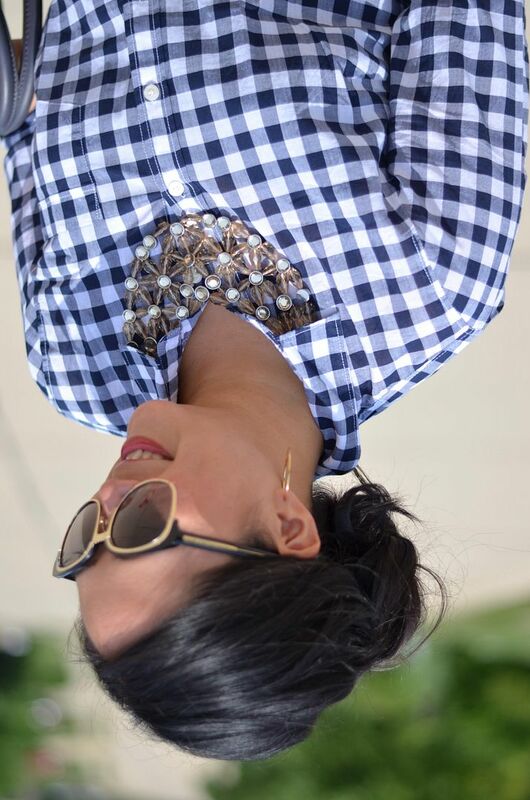 I love gingham and it's the perfect piece for summer wear. Thanks for the linkup. I'm looking forward to connecting with other great fashionistas! Wow that's a very pleasant surprise indeed Carylee! Love the mix of the shirt with the adorable bag!!! Thanks, Rebecca! I'm so glad I have this bag in my arsenal! Hah yes very overstimulating this post is! Very nice!!! The top is super cute. Congrats on the new car! I love the gingham shirt with the green skirt!!!! And congrats on the new Audi! Thank you! The skirt is a bit thick so I was worried it would look too fall but the shade of green helps keep it summery! I have the same gingham shirt and wear it all of the time! It looks so great paired with the green skirt! Love your necklace too! Congrats on your new car! Isn't it just the best?? I can't wait to wear it over and over. Definitely will be a staple!! What a great idea - I will email you! Yay for a new car! How exciting! I know how you feel about finding a car - I test drove heaps of them a few years ago and fell in love with VW. Plus, gingham is perfect for summer - love it! I seriously had no idea what I wanted and was overwhelmed at first! But in the end, I am happy! Thanks for reading! Congrats on the new car! 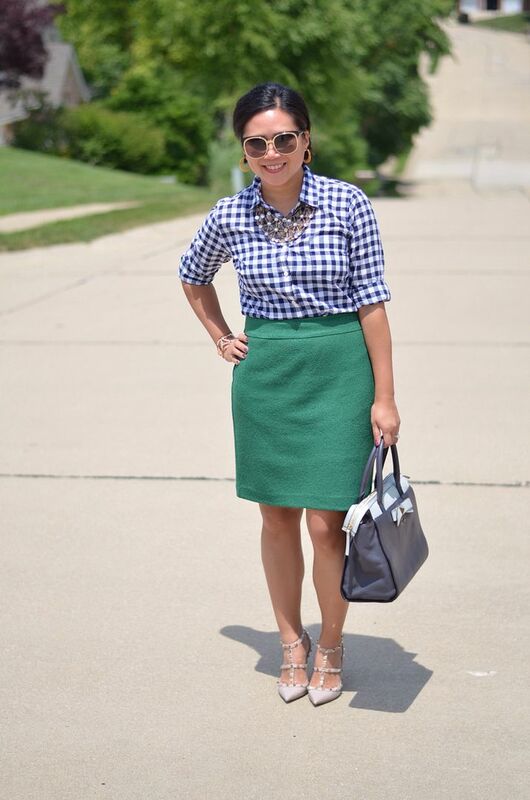 I never though the gingham top with a green pencil skirt would make such a great combo. The shoes are killer too! I figured it would be great for spring/summer! I wouldn't have paired this without the pinspiration! I looked at the Q7! What a great ride! I almost test drove it, too, but fell in love with the A6 pretty quickly! A6 is a fantastic choice!! Audi's are awesome to drive!! COngrats and enjoy the new ride!! Thank you! I thought it would pull together with the shoes nicely! And thanks again about the car! HOORAY for a new car! And I love your gingham top! What a great color pairing! I love it when I get a "surprise" package in the mail. Congrats on the new car! 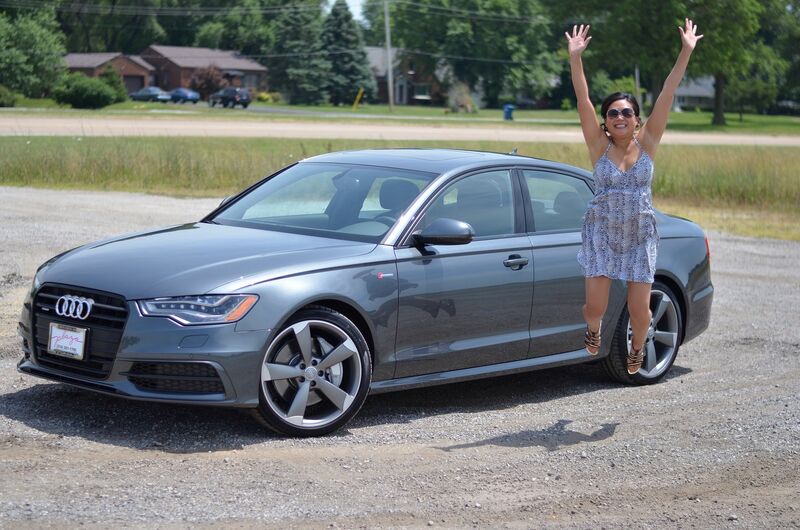 I used to have an Audi and they are so fun to drive! yay! I love hearing good things about the audi! Thanks!! And thanks for participating!! Oh no! That could be really frustrating! Hope you still find your perfect one! That shirt is so cute! I know you'll find yourself reaching for it a ton, even in Fall and Winter! 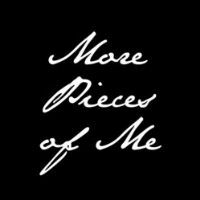 I love pieces like that! I also love your bag :) Perfect pairing! And congrats on the Audi! My husband is jealous lol. Haha! My husband is a bit too excited about *my* car! :) It's good we were able to agree on one though! And yes - I can't wait to style this for other seasons! I agree! Makes it special! Thank you! Thanks! I know I will reach for it a ton! Congratulations on your new car! I can imagine you and hubby are overjoyed and excited with the new purchase. Aww - thanks for the heads up! Great minds, for sure! I will check it out! I love your outfit! Gingham is one of my faves and I've been looking for a skirt like this! Congrats on your new ride! 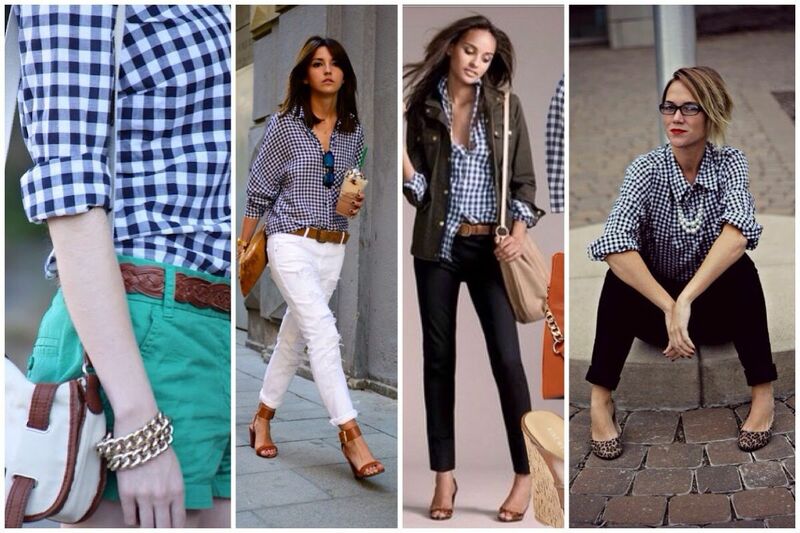 Hope you find your perfect gingham shirt! This one is really awesome! That is a great car! One of our neighbors has the same one. And I love the gingham. I have one from Banana Republic Factory and it's one of my best buys of the summer. Thanks for the affirmation!! Cant wait to get styling info from you, too, for this! I love this outfit! So classy. 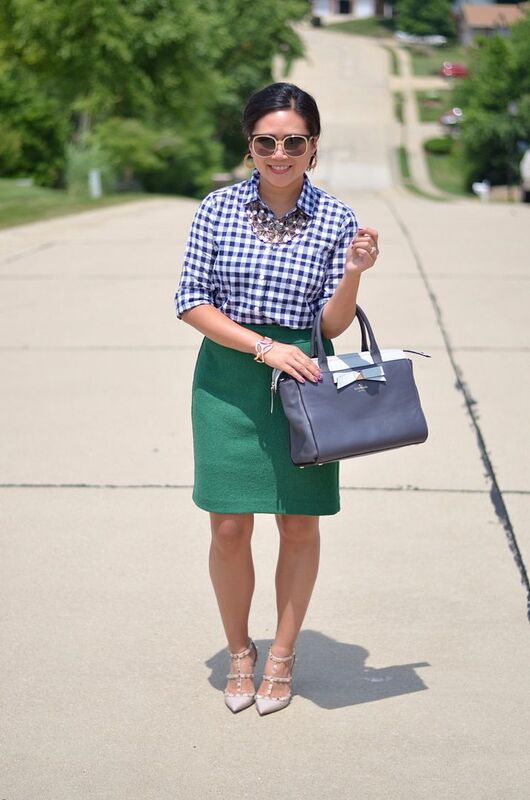 The gingham and emerald green are a perfect match! I love when a package you forgot about comes!! love the gingham!! and your heels, c'mon, youre killing me!!! I have the poor girls version, but one day they will say Valentino!! Aww - you will get your perfect pair, I can *feel* it! They're worth the splurge - absolutely the shoe addict's dream! Thank you for the nice note! Oh my gosh...I love this outfit so much. So chic and classic but still fun and trend at the same time. Congrats on the new car! Thanks, girl! I appreciate that! Can't wait to style this shirt different ways! Congrats on your new car! I should probably jump on that gingham top now too. I had no idea it was that cheap. Definitely recommend, especially for the price! I really love it. It's deathly hot here but I still felt comfy in it today! I have the same shirt and it's one of my absolute favs! Yes! Glad to know I'm in good company! It really is just perfect! Very nice! Such classic styling! You can never go wrong with gingham and congrats on the car!! Nice! Thank you! I have a handful of gingham in my closet now - happy about that! Ooh great steal for the J. Crew Factory gingham shirt! Loved the way you styled it, and loved your car photo! Thank you! And yes, it's def a great price for the shirt! Worth the wait! Thank you! I know you have plenty of style inspiration for me and this shirt! Love your look! Your Valentino rockstuds are amazing! I have the lower heel and they match with everything! I debated on the lower heel or this heel. I am surprised how comfortable these are, right out of the box! Congrats on the new audi, looks nice!!! You guys have a camero- cool!!! Yes, the husband is a bit of a car fanatic. Specifically GM. His dad has a ton of Corvettes. Yup, that's plural. And thank you! I just love her!!! I love this look...especially the shirt! So cute, and the color is great on you. Lovely! Thank you! It really is a great shirt! Congrats on the new car! That is gorgeous! I can't wait for the day I can actually justify a new car purchase. Right now it would be a little silly. Love your rockstuds, and your hair looks so pretty pulled back! I fought the car issue so hard! I knew we needed one, but it's hard to curb shopping! !